I received this book for review along with a re-release of Edward J. Ruppelt's 1956 book "The Report on Unidentified Flying Objects". As I read the "Flying Saucers over the White House", the reason for that combination made more sense. This book is part biography, part commentary on the life and work of Captain Ruppelt. But, more than that, it's also a thesis on officialdom's complex relationship with the UFO. Ruppelt was the head of Project Blue Book, a role which emerged from his interest in UFOs when stationed at ATIC, Wright-Patterson Air Force Base. The previous investigation into flying saucers taking place there was a tired and cynical investigation under the rather apt name Grudge. Ruppelt brought a fresh set of eyes to the mystery, at a time when the public and military's interest in the question of UFOS was peaking. Thankfully, he lacked the dismissive attitude and 'low mental level' of his predecessors, and appeared open to the potential for an extra-terrestrial explanation. But his feet were also firmly placed on the ground as he conducted his work - often with little funding and less manpower at his disposal. Eventually, however, his tenacity went unrewarded, as the top brass in the Pentagon decided to place the UFO beyond the reach of reasonable enquiry through Kafka-style manoeuvring, superbly exposed in this sharply intellectual book. Bennett is one of those rare authors, like Stanton Friedman, who can convincingly shed a cynical eye across the military-industrial complex. Of course, in any debate, there are two sides to the story. Each side spins the facts, and this book is a commentary with a particular viewpoint, like any other. But Bennett is not just projecting opinion, like so many do on the irate Internet of today. His work is contextual, historical, analytical. He seeks to place the UFO, and the Air Force's struggle to come to terms with it, into the social milieu of the times, and the changing face of modernism. This is true, and the human reaction to UFOs is vital to its understanding, as well as the changing face of the phenomenon itself over the decades/centuries. Sometimes Bennett waxes lyrical too much, turning the office politics of the Air Force into a Shakespearian drama. But his writing is well versed and educated, and defies easy dismissal by those who would be offended by his openness to another reality. Radar reports, trained observers, scrambled aircraft all attest to something real manifesting itself in the skies of the United States in the early 1950s. The phenomena in question defied rational explanation, although many were brought to bear. In the end, the chaotic display exhibited by an inept and intellectually-challenged Air Force in the face of the perceived UFO threat had to be culled, and Ruppelt was a victim of officialdom's whitewash. The days of enlisted men being able to speak their minds were fast coming to an end. There is more to it than officially kicking the subject into the long grass, though. Attention is also given in the book to how normally rational military men reacted in irrational ways when confronted with flying saucers. There were occasions, described by Ruppelt himself, where evidence about UFOs, in the forms of reports and data, was purposely destroyed by base commanders and intelligence officers. Such intervention would under normal circumstance be actionable, yet seemed oddly acceptable (an Escher-Penrose State). It was like the UFO did not fit into the great scheme of things in the military's materialistic and highly controlled mindset. It needs to be expunged. In this way, one wonders whether the abundance of UFO evidence handed over to various ministries and departments down the years was simply shredded by discomforted officials. Does the debris of the Roswell crash sit deep inside some toxic landfill, I wonder? Better buried and out of the way, perhaps. Bennett also argues that there was a lack of courage among the 1950s military to declare that the UFO represented something tangible, but unknown. In a masterful critique of the press conference held after the post-Washington sightings in the summer of 1952, he demonstrates how General Samford and his colleagues nullified the phenomenon in front of the nation's press and his own officers. A message was sent, the case was closed, and a direction of travel was forged by America's military that has survived right up to the current day: inexplicable encounters simply require more data before they become explicable, observers are unqualified to comment upon what they've witnessed, no matter who they are, and there is NO defence threat. Nothing to see here. This is a thought-provoking and superbly written book. Its new title is a big improvement, and its historical relevance remains strong. One wonders how our modern generals would deal with the UFO phenomenon should the flying saucers once again persistently buzz the skies over the nation's capital. Sixty years on, and I imagine the reaction would be much the same. 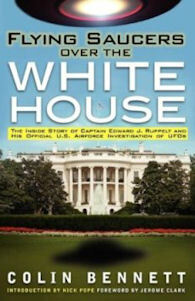 Subtitled "The Inside Story of Captain Edward J. Ruppelt and his Official U.S. Airborne Investigation of UFOs"